I’ve got her! Quick make a run for it! Saito and Shinpachi were chasing down rogue samurai resulting in a battle. Lord Aizu, the Military Commissioner agrees to place them under his care. So Serizawa invites the majority of the cast for a drink. 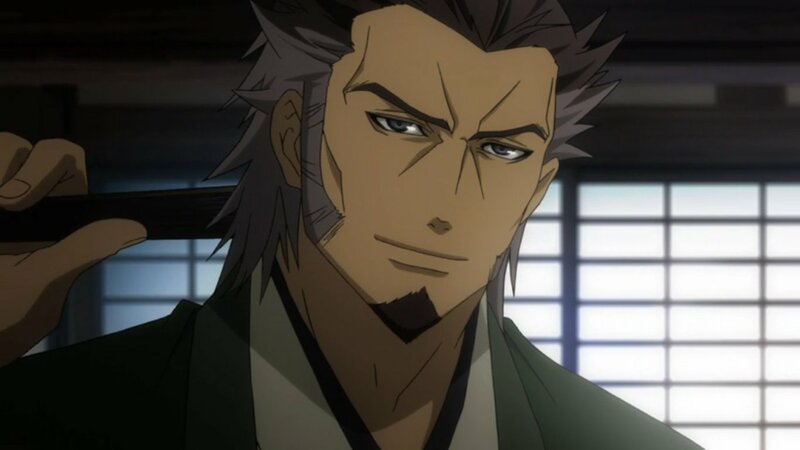 Whilst there Okita openly threatens to kill Serizawa, but he laughs him off insultingly. A little later whilst Serizawa gets angry at a young Maiko (apprentice Geisha) named Kosuzu. The others step in before things get nasty. Ibuki chases her but hears that she hates all samurai for using them like toys. 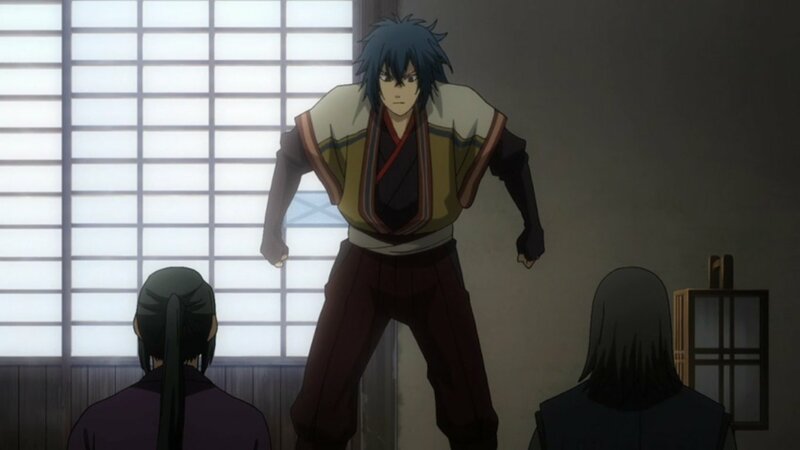 The entire fiasco angers Hijikata more. 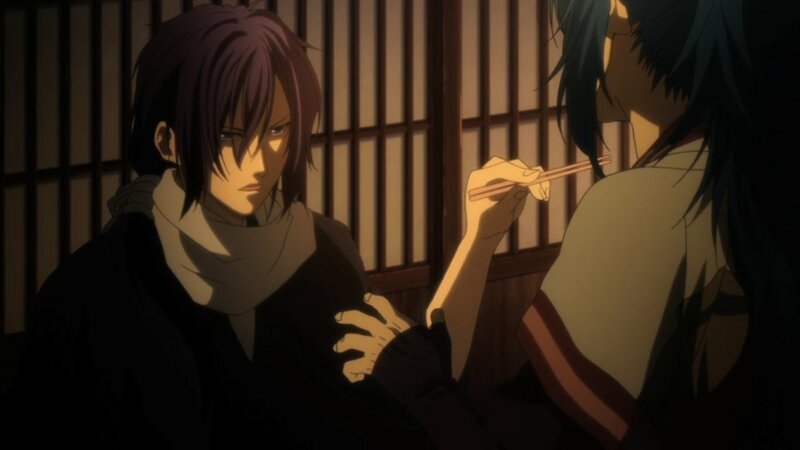 Ibuki is invited to join the roshigumi from Sannan after accidently overhearing Sannan and Hijikata talk. 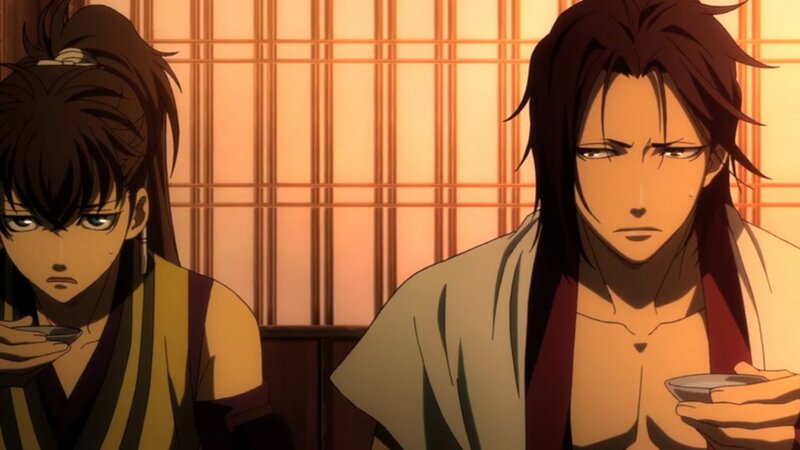 Hijikata rejects the idea as he saw through Sannan’s scheme of trying to get information out of Ibuki about Serizawa. 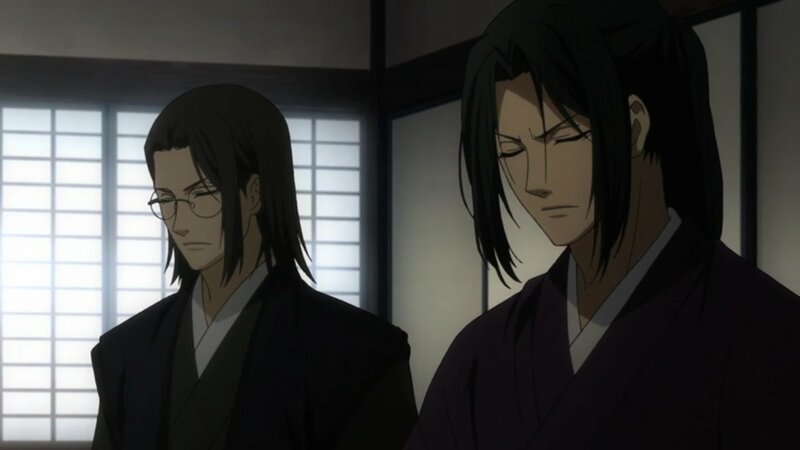 Hijikata proposes to Serizawa structuring themselves into a proper organisation with Kondou and Serizawa are the leaders, Sannan and Hijikata as commanders and a strict set of codes of conduct to govern the organisation that if disobeyed results in seppuku. Serizawa lets them get on with it and is confident that they won’t have the power to enforce those rules. 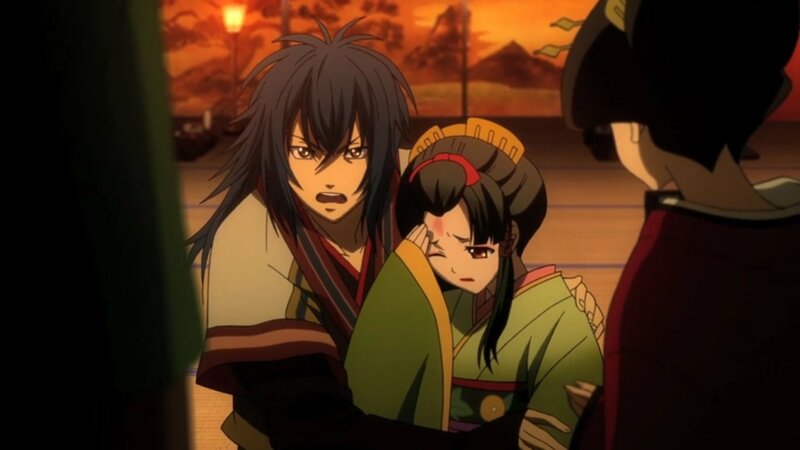 Because of Serizawa’s actions, it’s brought about a lust for killing in Souji and Hijikata wants to send him back home. He refuses and runs away. Minimal Ibuki development, something tells me he’s not really a main character but rather there as a plot driver… though he doesn’t even seem to be that, he’s just there, I actually don’t know why the anime’s ‘following’ him. Although there was that one point in which he was asked to join the Roshigumi where I thought they were finally going to develop him but that was just a ploy to get more information on Serizawa. At least the Roshigumi story is developing, they’re acting as Aizu’s volunteers for the moment. But it’s likely some big event will happen for them to be proper paid guards. What’s more interesting is the development with Souji. With the ridicule he’s receiving and the remarks he’s been making coupled with that look of craziness in his eyes, you know he’s going to do something big next episode. My bet’s on killing someone, rogue samurai by the sound of how things are going. And now that he’s ran off in the middle of the night, it’s the best time to find some samurais causing trouble and cut them down. He definitely looks like the type to cut someone down without a care. I wonder if that Maiko girl Kosuzu will come into the anime again. Would be odd to name a random girl unless she was going to be important somehow. I was thinking perhaps a love interest for Ibuki? Or perhaps someone with a bunch of ideals that inspires Ibuki to do something great? Either way, I believe she may show up again. Well, I’m expecting a Souji focused episode next. That running away is obviously the signal for his development. I think it’ll be rather interesting finding out more about him and where that sudden urge for blood came from.